Powers/Abilities: Kiden Nixon had the mutant ability to freeze time. When time was frozen, she could move freely while everything and everyone else was frozen in time. Whenever she directly interacted with anyone that was frozen, she caused time to come speeding back into effect and whatever she touched was affected by the speeding time, usually by having an extreme amount of force applied to it. For example, when she touched someone's arm, the speeding time caused the arm to get broken. History: (NYX: No Way Home I#1 (fb)) – As a young child, Kiden blew out the candles on a birthday cake while one of her younger brothers watched. (NYX: No Way Home I#1 (fb)) – Kiden’s father Nick held her while he posed for a photograph with Kiden’s brother, Tyler. (NYX: No Way Home I#1 (fb)) – The Nixons shared a family dinner. (NYX I#1 (fb)/NYX: No Way Home I#1 (fb)) - When Kiden was a child, her mother had her pretend to want to go to the park so that her father would be distracted while they got him a birthday cake. After getting some ice cream at Nino's local convenience store, Kiden was pushed out of the way by her father, who was gunned down in a drive-by shooting. (NYX: No Way Home I#1 (fb)) – Several years after her father’s shooting, Kiden took to cutting herself with a razor blade. (NYX I#1/NYX: No Way Home I#1 (fb)) - Kiden went to a rave party with her friend, Kara, where the two danced and took ecstasy. The next morning, Kiden was awakened by her mom, who yelled at her for not getting up to her alarm clock. As she got up to go to school, she was stopped by her brother, Tyler, who reminded her to tell Kara that he gave Kiden and Kara the ecstasy at a discount. After shrugging off her drug dealing older brother, Kiden was caught by her mother, whom she was trying to steal cigarettes from. Her mother asked if they could have a talk with one another after school, which Kiden quickly agreed to do in order to keep her mom from realizing what she was doing. Once her mother left and Kiden realized that her mother was out of cigarettes, Kiden left the house and stole a pack from Nino's nearby shop on the way to school. Upon arriving at school, Kiden met with Kara and the two watched local boy Hector pick on another student named Gordo. When Hector hit Kiden with a ball, she and Hector got into an argument with Hector commenting on her smoking habit. She then purposely blew smoke in his face, to which he replied by slapping her across the face. She immediately jumped at him, ripping his earring out with her hands. A teacher soon broke them up and as they each went to their respective classes, Hector whispered that Kiden was so dead. After class, Kiden and Kara was stopped by Hector, who had friends of his beat up on Kara. Hector held Kiden back as Kara was being beaten up, causing Kiden to yell stop. When she did so, everything around her froze in time. Surprised at what had happened, Kiden walked and looked at everyone frozen in the moment. Upon touching Hector's arm, time came spinning back into effect and the speed at which it occurred caused Hector's arm to break at the spot where Kiden had touched it. (NYX I#2) - The next morning, Kiden ate her breakfast while her brother Tyler argued with their mom about the marijuana that their mother had discovered. As their mother flushed the drugs down the toilet, Kiden whispered to herself for things to stop. Eventually, Kiden got worked into a yelling fit where she asked the family if they could be normal for just ten seconds and then she slammed the door on the entire family. Later at school, Kiden was sent to the principal's office due to the fight she was involved in the day before, where both the principal and Ms. Palmer attempted to get Kiden to tell them who broke Hector's arm. When Kiden would not admit who, the principal dismissed her from the office. Ms. Palmer followed Kiden out in the hallways, where Kiden was talking to Kara about her experiences the day before. The duo were stopped in the hall by Hector, who had snuck a gun into the school. Hector fired at Kiden, who yelled for things to stop, causing time to freeze once again with a bullet frozen mere inches from her head. At first scared at what had happened, Kiden eventually found the frozen time to be a very cool thing and once again taunted Hector as he was frozen in time. As she was taunting, she touched the hot gun and whispered threats into Hector's ear. When she whispered, she accidentally caused time to once again speed back into effect and since she had touched the gun, the speeding time caused Hector's aim to go way off, causing him to hit Ms. Palmer instead of Kiden. Following the shooting, Kiden ran away from home and school. (NYX I#4 (fb)) - After running from the school, Kiden secretly followed Ms. Palmer's ambulance to the hospital to make sure she was ok. Scared and realizing that she couldn't go back home or to school, Kiden took to life on the streets. She learned how to activate her powers at will after she was attacked in an alley one night. Before the attackers could get to her, she screamed the word "stop" and caused time to freeze. While in the "No Time" zone, where everyone was frozen but her, she learned how to deactivate the "No Time" zone by touching someone. She easily escaped her attackers by leaving time frozen for a while as she just walked away from them. Leaving time frozen for four months (three days in regular time), she wandered her way to Pittsburg, where she met a young homeless kid named Alex. She then decided to deactivate the "No Time" zone by kissing Alex. For the next five months, she stayed with Alex and a group of other teen runaways, learning how to beg for change and dumpster dive. Eventually, Alex got a bit homesick and left the group, prompting Kiden to give her family a call. She quickly hung up the phone, however, and hitched her way back to Alphabet City, New York. Once back in New York, Kiden visited her home where she found her brother Tyler talking to a friend of his. Tyler informed her that since she had left, their mother had met a new man and was getting remarried. Feeling that her family's life was better without her, she left without saying anything to her mother and went back to living on the streets. That night, she saw a vision of her deceased father, who told her to go to Ms. Palmer's home. (NYX I#2) - After Ms. Palmer had recovered from her gunshot wound, Kiden visited her home to check in on her, only to find her in a bathtub filled with blood. (NYX I#3) - Kiden immediately called 911 and an ambulance soon arrived to take Ms. Palmer to the hospital. After a quick questioning by one of the responding policemen, Kiden rode in the ambulance with Ms. Palmer to NYU Hospital, where she kept a watchful eye until Ms. Palmer recovered. Once Ms. Palmer was safe to return home, Kiden came with her and helped nurse her back to health. Cameron Palmer soon asked what Kiden planned on doing once she fully recovered and where she had been for the past six months. Kiden decided to reveal to Ms. Palmer that she was a mutant and that it was her fault that she had been shot. She then explained to Cameron that she had been told to come to that address, but Ms. Palmer did not believe any of what Kiden told her. Kiden finally got quiet when Cameron threatened to call child services if Kiden did not go back home the next morning. That night, Kiden had a dream where her deceased father told her to go to the Hotel Brasil, Room 202. She was shocked away and quickly found a Sharp-O pen to write down the address. After writing it down, Kiden left to go to the hotel. Cameron woke up upon hearing Kiden leave and found the notebook that Kiden had used to write the address down in. Seeing the address due to the marker bleeding onto the next page, Cameron followed Kiden to the Hotel Brasil, where they found a girl with claws sitting on some bloody sheets. (NYX I#5 (fb)) - After realizing that the blood on the sheets was from a dead man, Kiden and Cameron Palmer left the hotel with the girl in tow in search of a calmer atmosphere where they could sort things out. (NYX I#4) - The trio went to a restaurant on the corner of East 23rd Street and 2nd Avenue, where Kiden explained to Ms. Palmer what she had done in the six months after the shooting at school. She explained that her father had told her to save Ms. Palmer's life because they needed each other. Cameron got angry at Kiden's "riddles" and was prepared to take Kiden back to her mother's house until X-23 spoke up and explained how she did not murder the man who they found her with. After X-23 had explained how the man in her hotel room had committed suicide, the trio went back to Ms. Palmer's apartment where Kiden saw another vision of her father. (NYX I#5) - Kiden asked the vision of her father what he wanted and the vision replied that they needed to get out of Ms. Palmer's apartment. After composing herself, Kiden told X-23 and Ms. Palmer that they needed to get out and seconds later, a group of men busted into the apartment looking for X-23. 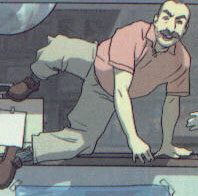 While the men, who worked for Zebra Daddy (a pimp who had sold X-23 into prostitution) searched the apartment, Kiden, X-23, and Ms. Palmer made their way down the fire escape. Two hours later, after the men had left the apartment, Kiden did a little dumpster diving to get the group some food. Inside the dumpster, Kiden saw yet another vision of her father. The trio were soon on a train headed towards the Bronx. Upon their arrival, they found a young girl named Tatiana running from anti-mutant mob. X-23, Ms. Palmer, and Kiden followed the mob into an alley, where Tatiana transformed into a cat-like state and scared the mob away. X-23 managed to calm Tatiana down and the group left the alleyway with Tatiana in tow. (NYX I#6) - After Tatiana returned to her normal form, Kiden attempted to explain their situation to her but Tatiana interrupted, saying that she believed everything about how Kiden was seeing visions of her dead father, and that X-23 had claws that came out of her hands and feet. Tatiana then opted to return home. When she started to leave, Kiden once again saw a vision of her father, telling her not to let Tatiana go. Tatiana left anyway and returned home, where her powers began to flare up again. Tatiana ran outside to find Kiden waiting for her, explaining that her powers were not a dream. After Tatiana rejoined Kiden and the others, Kiden went dumpster diving to get some food. Ms. Palmer soon chimed in the conversation, explaining how Kiden had ruined her life and that she could see why Kiden's mom was better off without her, causing Kiden to burst into tears. Kiden then continued to rummage through the garbage, while Tatiana complained about having to wait for Kiden to get another vision telling them what to do. (NYX I#7) - Soon after, Ms. Palmer came up to Kiden and apologized for the way she had talked to her earlier. Ms. Palmer suggested that the group go back to her apartment to see what they could find but Kiden opposed the idea until she saw another vision of her father, who told her that they did need to go back to the apartment. Once they arrived at the apartment, Ms. Palmer told the girls to wait for her light to come on so they would know she made it inside ok. If the light didn't come on, then they would need to call the police. When the girls didn't see the light, Kiden was about to go inside to help when her father appeared to her once again, explained that it was a setup, and that she needed to run away. 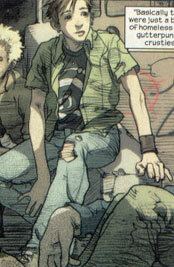 He then introduced Kiden to Felon, a young mutant boy who was going to help. Kiden begged her father to explain what was going on, but he just told her to do as he said because he had worked so hard. Kiden then heard Ms. Palmer scream from inside her apartment but before she could act, she and the girls were confronted by Zebra Daddy, who had been searching for X-23. X-23 fought back, cutting off Zebra Daddy's hand and decapitating one of his henchmen, Diesel. Kiden, Felon, and Tatiana soon joined in the fight as well, with Tatiana saving Ms. Palmer. Zebra Daddy soon managed to fight back himself by gunning down X-23. Seeing X-23 being shot made Kiden remember Zebra Daddy's face from her past as the man who had killed her father all those years ago. At that same time, Tatiana also lost her grip on Ms. Palmer, but before Cameron could be hurt, Kiden yelled "stop" and entered the "No Time" zone. While inside the frozen time, Kiden thought very hard about punching Zebra Daddy as hard as she could, allowing for the speeding time to do its trick, but she instead decided to pull a mattress under the falling Ms. Palmer. When she un-froze time, Ms. Palmer was saved and Zebra Daddy was instead killed by X-23, who stabbed him through the heart with her claws. As the cops began to arrive on the scene, Felon told them they would be safe as his house in District X. After asking Felon if they could trust him, Kiden decided to go with him, whispering to Ms. Palmer that in case they couldn't trust him, she had a contingency plan courtesy of the U. S. Post Office. Two days later, Liz Nixon and family got in their car and drove away, with a postman chasing after them, trying to tell them that they had a letter. (X-Men: The 198 Files - BTS) - Kiden Nixon was one of the mutants who survived the events of "M-Day" with her mutant powers still intact. The Office of National Emergency seemed to think of her as a significant threat should a war between humans and mutants erupt due to her anti-authoritarian nature and powers. (NYX: No Way Home I#1 (fb) – BTS) – Kiden got a job working at the Corner Cafe as a waitress/dish girl. (NYX: No Way Home I#1 (fb)) – Tatiana Caban accompanied Kiden Nixon as she rummaged through a dumpster looking for a birthday present for Bobby Soul. After finding a broken snowglobe, Kiden and Tatiana returned to Bobby’s apartment where Kiden hid the snowglobe amongst the other presents she had found for Bobby. Shortly thereafter, Kiden attempted to feed L’il Bro until Cameron Palmer arrived, bringing them all groceries. Ms. Palmer then tried to get them all to return to school but Kiden quickly reminded Cameron that she was still technically a criminal. Not long after, Kiden left for her job, freezing time briefly to make sure she made it to work on time. While taking out the trash at work, her boss gave her a returned letter that Kiden had sent to her mother at their old address, reminding Kiden not to use the restaurant’s address as her home address. When her shift ended, she met up with Bobby, Tatiana and L’il Bro, where Bobby informed them all that his landlord had raised their rent. The group then made their way to Ms. Palmer’s apartment for dinner but upon arriving, Kiden saw a vision of her father telling her to run and when they opened the door, they found Ms. Palmer’s apartment ransacked and Palmer missing. (NYX: No Way Home I#2) – Checking the rooms of Cameron’s apartment, Kiden found a letter written to Cameron from her ex-husband, explaining that he had left Cameron because she had refused to give up trying to help the children that her ex-husband felt were con artists. Kiden then looked up and, speaking to her father’s spirit, explained that he could have warned her and that she could had saved Cameron. When Nick replied that she still could, Kiden demanded to know where Cameron was but Nick was gone. Kiden then gathered together her friends and demanded they all leave, as the police would be there soon. As they left, Bobby argued with Kiden that they couldn’t keep living on the run but Kiden angrily stood by her stance that they needed to save Cameron, little knowing that they were all being watched by the enigmatic Tattoo Man. Returning to Bobby’s apartment, Kiden and the others found it surrounded by police and realizing they had been set up, Kiden decided to use her powers to sneak inside and get their things. An hour later, they continued their earlier argument of whether they should rescue Cameron or not, with Tatiana siding with Kiden that they should. Revealing that they had found a hat in Cameron’s apartment that he recognized from one of his old criminal friends, Bobby led them to his old friend D’sean’s apartment, where Tatiana was attacked by a gunman and shot. (NYX: No Way Home I#3) – Finding Tatiana, Kiden rushed to tend to Tatiana’s injury while Bobby took out the gunman. Using the gunman’s gun, Kiden interrogated the gunman until he revealed that Cameron had been delivered to a woman at Empire State University. D’sean arrived soon after and prepared to shoot them all but Kiden grabbed L’il Bro, Bobby’s hand and, since Tatiana was holding onto Kiden’s leg, used her powers to freeze for everyone but them. Escaping, Kiden and Bobby got Tatiana to a hospital, where the television showed images of them as being involved in the disappearance of Cameron. 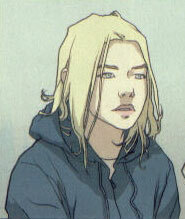 As soon as they appeared on television, Kiden used her powers to allow for her, Bobby and L’il Bro’s escape, leaving Tatiana to receive medical attention for her gunshot wound. Visiting Empire State University to meet up with the Tattoo Man in an effort to learn Cameron Palmer’s location, Kiden was informed that the trouble they’d been put through was only the beginning of their survival. When L’il Bro psychically projected an image of a dragon fighting a robot, the Tattoo Man used it as a distraction to knock Kiden out, prompting Bobby to possess the Tattoo Man and force him to stab himself. When Kiden came to, she found that Bobby had no memory of who she was or even who he was himself. (NYX: No Way Home I#4) – Attempting to learn more from the Tattoo Man’s death using her powers, Kiden investigated, unaware that she was in the sights of the mysterious Sniper Chick. Returning time to normal, Kiden tried to help Bobby remember who he was by getting him to help take care of L’il Bro. Using her powers, Kiden and Bobby traveled with L’il Bro to the hospital to rescue Tatiana. Finding SHIELD Cape-Killers inside, Kiden freed Tatiana but her powers briefly stopped working before she managed to reactive them, accidentally bringing a SHIELD agent with them. After Bobby knocked out the agent, the group escaped into the city and eventually decided to take Tatiana to Dr. Cecilia Reyes, who operated an underground clinic out of her apartment in Chinatown. After patching Tatiana up, Dr. Reyes told them they could stay in her apartment for the night to rest but Kiden snuck out and was confronted by the Sniper Chick, who proved resistant to Kiden’s mutant powers, punching Kiden even when Kiden had frozen time around herself. Taunting Kiden, the Sniper Chick gave Kiden a photo of the tortured Cameron Palmer. (NYX: No Way Home I#5) – Returning to Dr. Reyes’ apartment with a black eye, Kiden explained that they all needed to leave Dr. Reyes. Leaving Dr. Reyes’ apartment and hiding out in the subway, Kiden argued with Bobby about their safety and, unwilling to risk their lives further, Kiden walked in front of a subway train, using her powers to seemingly disappear. Returning to Empire State University, Kiden met the Sniper Chick, who drugged and captured Kiden. (NYX: No Way Home I#1) – Kiden was left hooked up to an IV system and tortured by the Sniper Chick. (NYX: No Way Home I#5) – While captured by the Sniper Chick, Kiden was visited by her father’s spirit, who told her it would be ok.
(NYX: No Way Home I#6) – Under the influence of the Sniper Chick’s drugs, Kiden hallucinated that Cameron Palmer blamed everything bad in her life on Kiden’s interference in it. She then imagined her friends had similar feelings. Eventually, her father brought her out of her lucid dreams, to whom Kiden once more stated that he could have warned her. When the Sniper Chick arrived to find Nick trying to help Kiden, she attempted to tell Kiden about Nick’s deal with the Sniper Chick’s power player father. Nick quickly ordered the Sniper Chick to leave just as Bobby and Tatiana arrived with L’il Bro to save Kiden. Learning that L’il Bro had mutant powers, the Sniper Chick accused Nick of going against their deal but L’il Bro summoned a psychic dragon that bit the Sniper Chick’s head off while a stunned Kiden watched. Freeing Kiden, Bobby and Tatiana went to save a terrified Cameron Palmer, who demanded they all stay away from her. Helping her escape despite Palmer’s ravings, Kiden and her friends dropped Palmer off at Memorial Hospital and escaped into the city using Kiden’s powers to continue surviving. (X-23 II#1) – While under psychic attack by the omnipathic Gamesmaster, X-23 discovered the homeless Kiden Nixon, Tatiana Caban, Bobby Soul and L’il Bro huddled around a fire arguing once more that they could not continue living on the run. 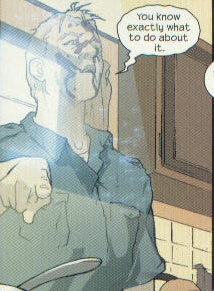 L’il Bro soon projected a trail of images and, sensing an attack, Kiden froze time and followed the trail to X-23. Bringing X-23 back to the fire, Kiden noticed that X-23 had been cutting herself again and asked if X-23 had returned to her old ways. X-23 replied that she had not but decided to leave them. When Kiden began arguing with Bobby over whether they should just let X-23 leave, X-23 took it upon herself to leave off the room of the building they were on in an effort to escape the Gamesmaster’s psychic meddling. Trying to save her, Kiden stopped time but lost control of her powers before she could find something soft for X-23 to land on. Recovering due to her healing factor, X-23 thanked Kiden for trying to save her and Kiden’s friends soon joined back up with them. Wolverine eventually tracked X-23 to Kiden’s location and reluctant at first to trust Wolverine, Kiden agreed to let X-23 return to the X-Men, telling X-23 that if she ever needed to run away again, she could run to Kiden and her friends. (Heroic Age: X-Men I#1 – BTS) – After taking over SHIELD following the defeat of the corrupt Norman Osborn, Steve Rogers decided to review various mutants to discern possible threats. Writing up a dossier of Kiden, referencing her O*N*E file to learn her history, Steve seemed concerned over whether Kiden was a possible threat or ally. Comments: Created by Joe Quesada, Joshua Middleton, and Jean-Francois Beaulieu. 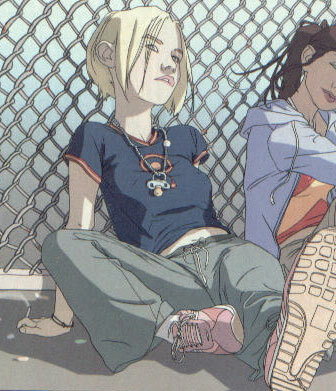 Alex was a homeless kid whom Kiden befriended during her the time that she spent learning how to better use her powers. After teaching Kiden how to beg for change and dumpster dive, he eventually got homesick and went home. Eugene was a local drug dealer who pushed outside of Kiden's family home. On the day after she visited a rave, Kiden told Eugene to get a life, calling him an amateur under her breath. 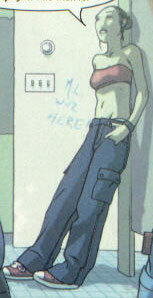 Kara was Kiden's best friend at school and even attended rave parties with her. After Kiden angered Hector, Kara became very worried about what Hector would do as revenge. That same day, Tamisha and a group of girls attacked Kara while Hector held Kiden from interfering. The attack caused Kara to wet her pants in fear and the day after, Kara spoke with Kiden about why she was called to the principal's office. After their class, Kara accompanied Kiden through the halls until they were stopped by Hector, who had brought a gun to school. Kiden activated her mutant powers and accidentally caused Hector to misfire and hit their teacher, Cameron Palmer. Ms. Palmer collapsed in Kara's lap as Kara screamed for help. Six months later, Kara was confronted by a mutant named Felon, who was trying to get information about Ms. Palmer's connection to X-23. When Kara refused, Felon entered her body and told her that he would force her to slap Tamisha. He then left Kara's body, leaving her at school. Nino owned a local shop that Kiden and her father used to go to get ice cream. He remained friends with Kiden over the years following her father's death, not realizing that Kiden was stealing cigarettes from his shop. In order to steal a pack, she told Nino that a customer was shoplifting, prompting Nino to jump over the counter and angrily question the young man. Nick Nixon was Kiden's policeman father who was gunned down in front of her by Zebra Daddy when she was a child. After he died, he survived as a spirit that spoke to the younger brother of the mutant named Felon. When Kiden's mutant powers surfaced, Nick appeared to her and told her to go to Ms. Palmer's apartment where Kiden found her in a bathtub of blood. 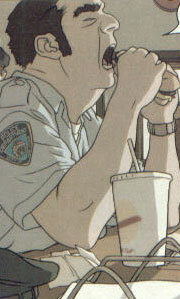 Pat was a policeman that worked with Kiden's father. Tamisha was a girl with an attitude who went to school with Kiden and Kara, who was friends with Hector. Tamisha was responsible for beating up Kara in front of Kiden after Kiden had torn out Hector's earring.